Overview: A short jam about sharing the love of both space and bunnies. 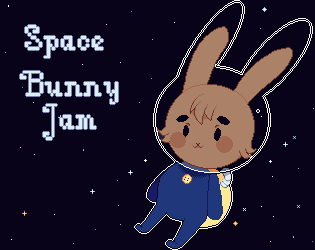 The jam is two weeks long and deals with you having to create a game base around space and bunnies. The reason this jam was created so it can give a little push to anyone who wants to create a short game in a short time and have a theme to follow. You are allowed to use any engine you wish and you are allow to work alone or in teams. Please don't use and promote any animal cruelty, racism, sexism, transphobia, anything that spreads hate. Though you are allowed to make a game that covers heavy topics, just makes sure it isn't a game that is made to hate someone. Treat everyone with respect, since we are all here to have fun. Make sure you take breaks and take care of yourself, this isn't a race. This jam is meant to be relaxing and to have fun. Don't work in engine before the jam starts. You are allowed to preplan. That means you are allowed to work on assets, concept art, writing, ect (since how short this jam is, so planing ahead of time is a-okay, plus to take pressure off). Though just make sure you don't touch the game engine you are planing to use before the jam starts. Once the jam starts you are allowed to do work in the engine. Part of the theme of this jam is that your game must contain a bunny, though it doesn't just have to be animals. Bunnies can be plush animals, toys, more human like, personifications, robots, ect. Though it has to show that in design it's a bunny/rabbit. Also you game at minimum should have one rabbit/bunny base character or thing in the game that is part of the game. If you have additional questions feel free to ask in the community section. Space Bunny GameJam: Collect stars for fuel as a cute bunny. An incomplete game about saying goodbye to love ones before you go to space. There's never enough space for all these bunnies! A Stealth Game Made for the Space Rabbit's Game Jam! Space, rabbit, lasers, explosions and aliens. What else ?